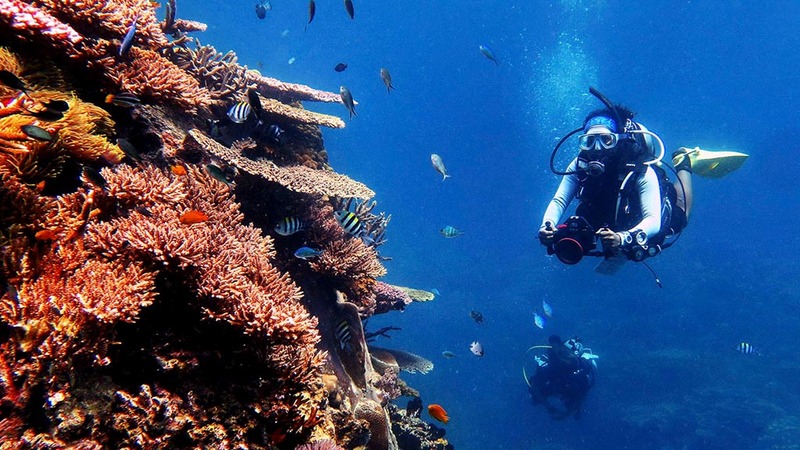 On Tioman diving is the obvious activity. 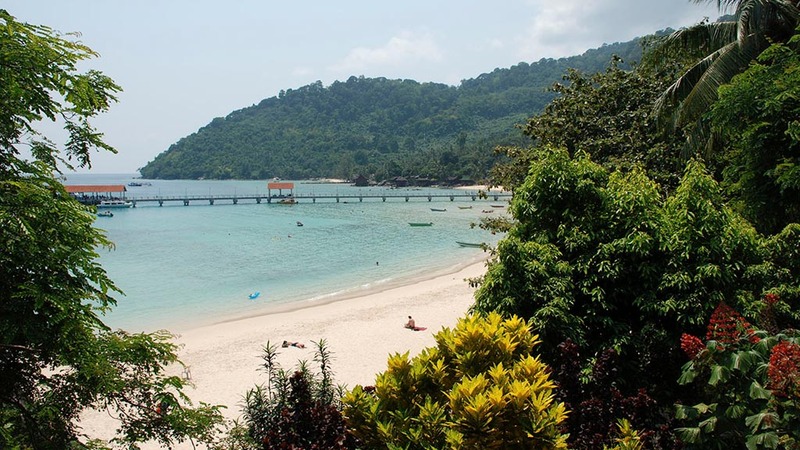 Tioman Island is sparsely inhabited with just 8 villages and 18 beaches, most of them only accessible by boat and pristine. 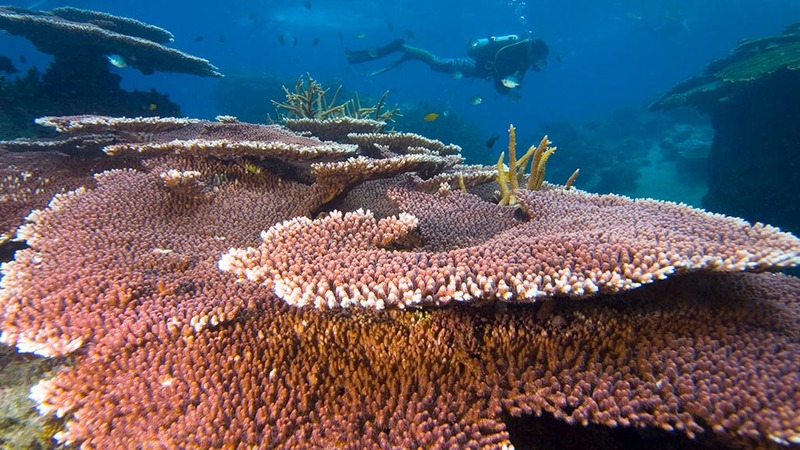 The low population and lack of urbanisation, plus the fact that the island sits within its own marine park means that the reefs are still in excellent condition. 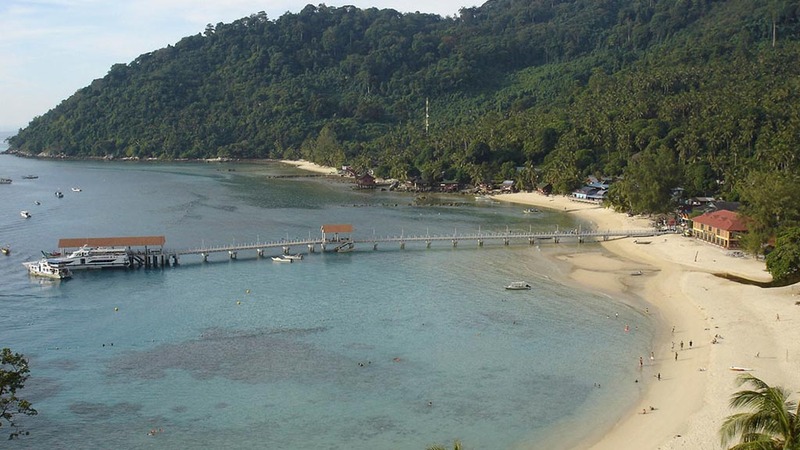 There are two main centres as far as diving Tioman is concerned and they are Salang Bay on the northern tip, and Air Batang Bay (aka ABC) on the west coast. Salang Bay is small and compact, so resorts, restaurants, burger stalls, mini markets and dive shops are literally next to each other. The bay is surrounded by a beautifully dense rainforest and its shallow lagoon is perfect for snorkelling and scuba diving – Salang has some amazing shore dives. 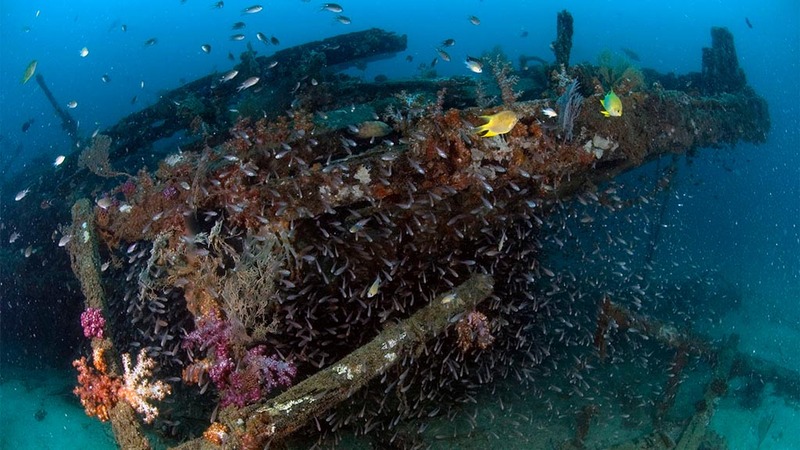 The jetty is teeming in fish life, as are the southern house reef, the northern house reef and the remains of Salang Wreck. ABC or locally known as Kampung Air Batang is a long stretch of rocky shoreline a few kilometres north of the main village Tekek. 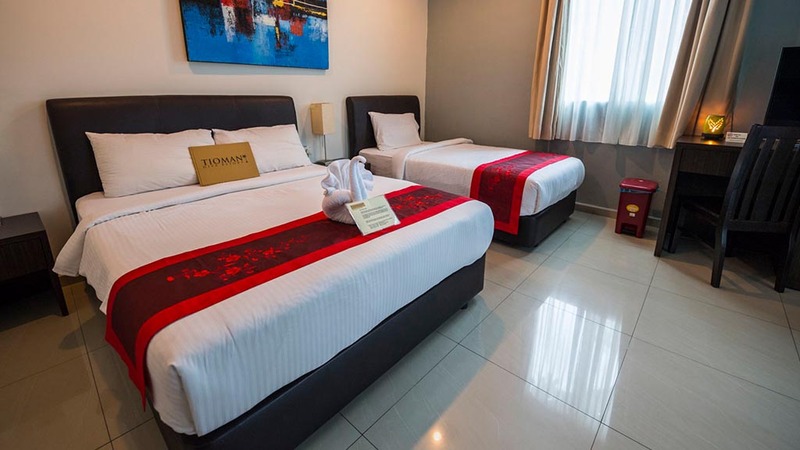 It is a quiet place where travellers can find small resorts offering a variety of room categories ranging from backpacker-style fan rooms to our luxury executive rooms. It has a number of reefs and wrecks just off shore. Tioman Island (Pulau Tioman in Malay language) is located 32km off the east coast of Peninsular Malaysia. The island is some 39km long and up to 12km wide. There are numerous dive operators scattered around Tioman Island, but B&J Diving has two dive centres, one in ABC and one in Salang, three boats, and a big team of dive guides and instructors eager to take you to all their favourite places. 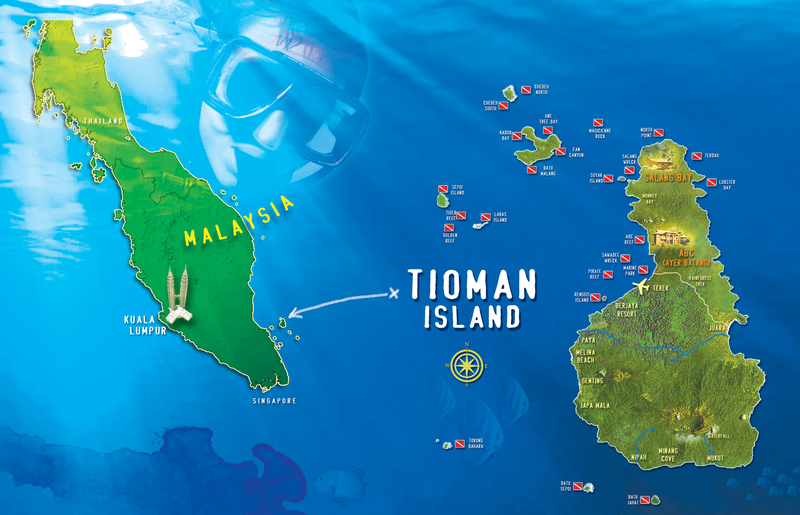 They even have the Tioman Dive Resort – which offers some of the smartest accommodation, right next door to their diver centre in ABC. As a PADI 5 Star IDC they offer all the PADI training courses. Tioman Island is home to some of the healthiest coral reefs in South East Asia and boasts a myriad of marine life. 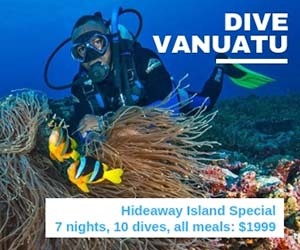 It is the best place to dive the most beautiful coral gardens in the South China Sea, swim with a huge variety of tropical reef fish, turtles, sharks, cuttlefish and search for nudibranchs in one of the best macro spots in the world. Some of the best known sites are around Coral Island (Pulau Tulai) in the north. 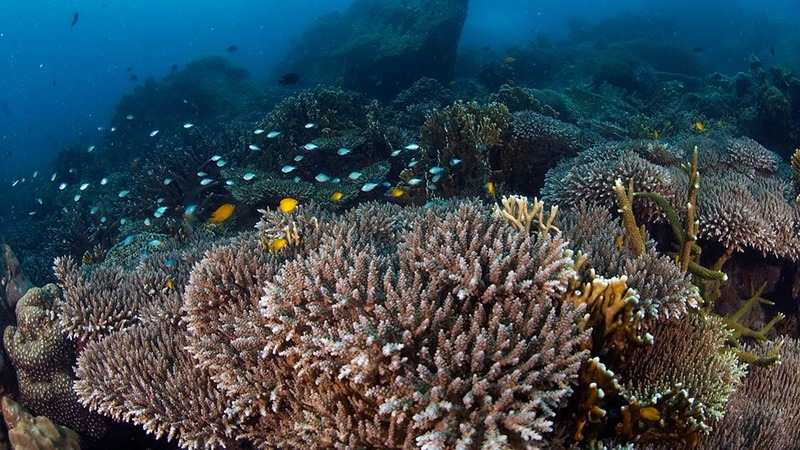 Read our guest post on the delights of diving Tioman. There’s a wide range of accommodation in Salang Bay, ranging from very basic fan bungalows to deluxe air con rooms. Salang resorts are generally fairly basic so don’t expect daily room cleaning service. Rooms are only cleaned whenever you leave your key at the reception. Both the Salang Pusaka Resort or Salang Indah Resort are all fairly close to the PADI 5 Star Dive Centre (within a 3 minute walk) and Salang Indah has direct access to the beach. Resorts in ABC offer a variety of rooms, all with en-suite bathrooms. Air-conditioned rooms generally have a hot water shower, whereas basic fan rooms only have cold water shower and a toilet. 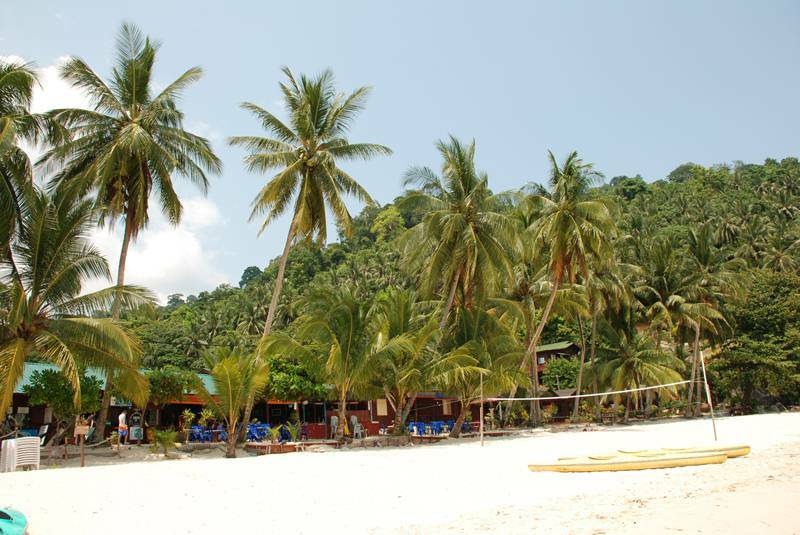 There is a good selection of small resorts available in Ayer Batang (aka ABC Bay), though the best is undoubtedly the Tioman Dive Resort (TDR). If they are full, their neighbours (Tioman House Bungalows, Cozy Inn and Fiqhtya) have nice rooms too. 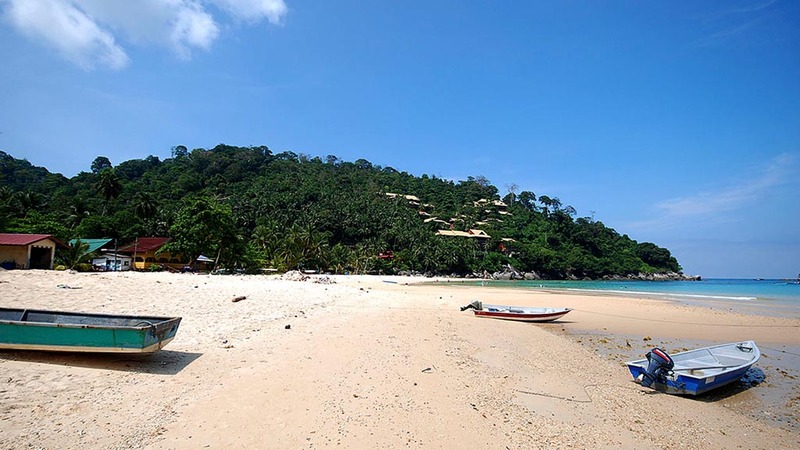 Note that many of the accommodation options on Tioman do not include meals which allows you to try out the different restaurants along the bay. There are plenty of restaurants in ABC and Salang Bay which serve a great variety of local cuisine, Thai and Indonesian dishes, Western meals, fresh BBQ seafood or BBQ chicken. As many of the accommodation options have no restaurant, you will have the opportunity to try a different venue and cuisine every evening. Famous Roti Canai either plain or with cheese, egg, sardine or banana can be found at Salang Indah Restaurant right next to our dive shop. During the day they serve plenty of Asian and Western dishes and at night you should not miss the fantastic BBQ sea food, fresh from the ocean. Salang Dreams Restaurant right next to the jetty has become one of the most popular restaurants thanks to its perfect location. They serve finger licking whole BBQ Chicken with BBQ potato and sweet corn, fresh seafood, Asian dishes but also steaks and pasta. The food is good, the price is fair but the service gets slower in the evening when the place is jam packed. Within Salang Pusaka Resort you can find their own beautiful restaurant. They have nice settings and serve you the standard local dishes or BBQ seafood, steaks and grilled vegetables. The have a projector and often show movies in the evenings. The Salang Sayang Restaurant is a bit pricier as it’s located right on the beach. Another great place to enjoy BBQ seafood or chicken and of course you should not miss out to try some of the local dishes like Mee Mamak (fried noodles). Those who really want to try local dishes must go to Salang Complex during lunch hours, as this is where the locals eat. The few food stalls serve Nasi Campur (mixed rice) meaning that you get a plate of rice and choose your own toppings. It’s the way only locals and insiders eat – cheap and delicious. Also not to miss is White House restaurant a bit further north. They serve amazing BBQ seafood, all freshly fished by the locals. In ABC there’s a bit of a walk between restaurants as the whole place is less compact. In the northern end you find the typically local small beach restaurants, such as ABC Cottages which serves mainly Asian dishes right on the beach front. Next to B&J Diving is Fiqthya Chalets, where you can find a large variety of Western and Asian dishes. The food is good but a bit pricey and the service is ‘relaxed’. Next to Fiqthya is Johan’s Resort, which serves primarily Asian cuisine for lunch and BBQ seafood for dinner. Walk further towards the jetty and you find South Pacific Restaurant. If they have fresh fish on the specials, order either sambal (spicey) or sweet & sour style. Altenately order from the menu and try their curries and fried rice. If you like local cuisine then a visit to Zinza’s Restaurant right at the jetty is a must. 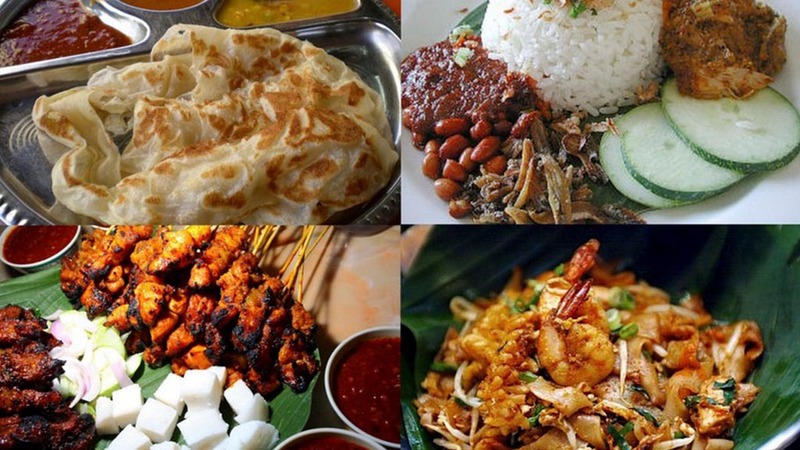 Have a Nasi Lemak (coconut rice) for breakfast and for lunch simply ask the owner what’s on the menu. Five minutes south of the jetty is Mawar’s, a favourite dinner spot where diners can enjoy typical Asian dishes and also western fayre like chicken burgers – all at super cheap prices. A further 5 minutes south brings you to Nazri I Resort with their large sea facing restaurant. A good place to have dinner where you can choose from BBQ seafood, grilled meats and local dishes. One of the highlights in ABC is Sunset Bar. Situated right at the beach just past Nazri I, it is renowned for its pizza, fried chicken wings and chicken sandwich. It’s also a cosy place to hang out in the evenings to enjoy a beer or a mojito while reflecting on your latest diving experiences. The house reefs in Salang and ABC also offer some fantastic snorkelling and all you need to do is rent some snorkelling gear and jump in the water. Many local operators offer round the island trips. They bring you by speedboat to Juara on the eastern side of Tioman. From there you go all the way south to visit Mukut and the Asah waterfall before having lunch in Paya Village. Your next stop is likely to be Renggis Island, a perfect spot for snorkelling. And finally they are likely to bring you to the Marine Park, again for snorkelling, before returning to base. Tioman is densely covered with some of the oldest rainforest in the world. Exploring the jungle is a must if you’ve never hiked in a rainforest before. There are several short and long trails available from both Salang Bay and ABC to different bays, ranging between 2 to 6 hour round trips. Sea kayaking is a fantastic adventure. If you’re fit enough, you can kayak all the way to famous Monkey Bay or Turtle Beach, but don’t try to attempt to go all the way to Coral Island – it’s further than it looks. Costs for kayak rental are in the range of MYR 15.00 per hour. If you fancy a high energy activity after a fantastic day of diving, then why not join the local boys and girls for a round of beach volleyball? There are 2 nets available in Salang Bay and games are on every day after 5pm. 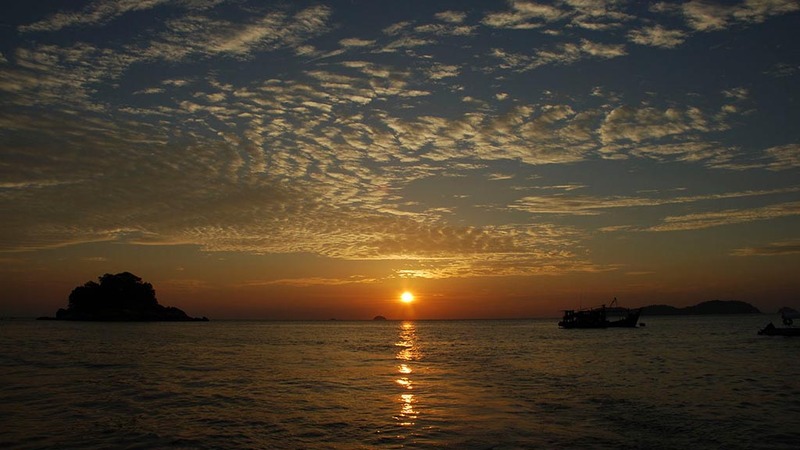 The diving season for Tioman Island starts on 1st February and ends by early November. Tioman is pretty much shut down over monsoon (Nov-Jan). The weather on Tioman Island is fine all year around. On most days you can expect sunny skies and little wind with a few clouds overhead. As Tioman Island lies in the tropics and is covered by dense rain forest, brief rain showers are common but usually last less than an hour. Free WiFi is available at our dive centres but bear in mind the connection on the island is very slow. The most reliable telecom provider for Tioman is Celcom. Purchase a pre-paid card if you prefer to have your own internet data plan and/or if you need to make phone calls. Tioman Island is in the state of Pahang – a 2 hour ferry ride to the east from either Mersing or Tanjung Gemok on the mainland. You can get to either port from both Kuala Lumpur and Singapore by coach service. There are coaches leaving directly from Kuala Lumpur to Mersing and Tanjung Gemok departing several times daily from Terminal Bersepadu Seltatan (TBS). The journey takes approximately 6 hours and costs between MYR 31 – 45 each way. Coaches leave directly from Singapore and depart several times daily. It takes about 4 hours to get to Mersing and 4½ hours to Tanjung Gemok. The cost is SGD 30 – 40 each way. There is a coach that departs just before midnight and gets you to the ferry at 4am (well before the first sailing at 8am). 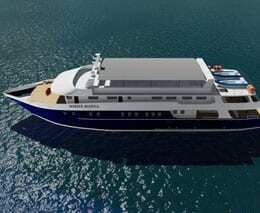 ABC is usually the fourth ferry stop, and Salang Bay is the last. 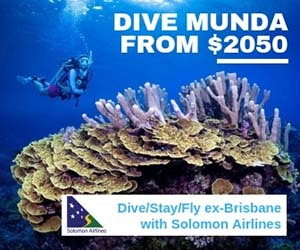 If you can afford it, you can also fly directly to Tioman.